The French Revolution changed the history of Europe irrevocably. It challenged the social order of the ancient regime and the legitimacy of kings and all hereditary ranks, unleashed nationalism and the concept of self-determination, and allowed the rise of Napoleon. The Corsican general went on to become Emperor of the French and conquer most of Europe, before being twice defeated by the combined forces of the European rulers, who put their differences aside to fight a common threat. Once Napoleon has been exiled for good, it was time for the great powers - represented by Castlereagh (Great Britain), Metternich (Austria), Talleyrand (France), Hardenberg (Prussia) and Emperor Alexander (Russia) - to reconstruct Europe. Their objective was to resize the main powers so they could balance each other off and guarantee peace. They also wanted to destroy the forces of revolution that had caused havoc on Europe and were threatening to overthrown more rulers. The Congress of Vienna, therefore, was more than a simple reunion to divide territories among the great powers. It was the beginning of the "Congress system", which would see the main players of the Congress of Vienna routinely reunite and collaborate to fight the threat of revolution. Although the experiment ended with the death of the last of its founders, it marked the beginning of modern diplomacy and promoted the idea of international co-operation to avoid future wars. Some consider it the ancestor of the League of Nations and the United Nations. In his book, The Congress Of Vienna And Its Legacy: War And Great Power Diplomacy After Napoleon, Jarrett highlights the importance the Congress of Vienna had on the future of Europe. He starts from the beginning, the French revolution and the rise and fall of Napoleon, to explain the events that brought about the Congress. Then, it describes the decisions the great powers took there, and the many crises they had to deal with in the following years. The last chapters deal with the legacy of the Congress. Was it, all things considered, a success or a failure? I admit, when I picked up this book, I thought the topic would be quite boring. But it wasn't. Jarrett's account is very detailed and extensively noted. The sheer amount of facts and players mentioned should make your head spin, but, somehow, Jarrett managed to create an engaging narrative that's easy to follow. And if you still struggle, you can always consult the chronology and the short biographies of the protagonists at the end of the book. If you're interested in knowing more about the Congress of Europe, and how it is still affecting the world today, I highly recommend you give it a read. 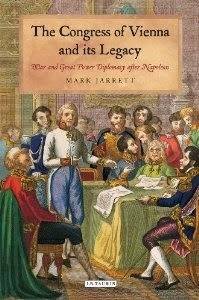 The Congress Of Vienna And Its Legacy: War And Great Power Diplomacy After Napoleon By Mark Jarrett minutely and exhaustively describes the events that have summoned the Congress, the decisions taken there, and how they have affected the world ever since. Informative and insightful, the book is written in an engaging style that won't bore you.